This place is 38 Kms towards east of Mysore. 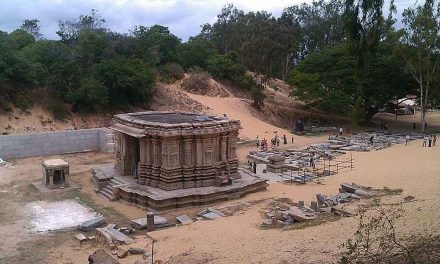 Somanathpur, a small village on the left bank of river Cauvery is an outstanding centre of tourist importance for its wonderful Hoysala temple, dedicated to Prasanna Chennakeshava constructed in 1268 A.D by Soma, an officer of the Hoysala Kingdom. The temple is built on a star shaped plan similar to other Hoysala temples at Belur-Halebid. It is a triple shrine temple, of which two are dedicated to Lord Janardhana and Venugopala, the two different forms of Lord Vishnu. The Keshava temple is a trikutachala , situated in a courtyard 215 ft. in length and 177 ft. in width, surrounded by a prakara . It has a verandah along its interior, divided into 64 cells each formally housing a deity. Rows of lathe-turned pillars support the ceiling of their frontage. The temple proper stands on an elevated jagati, which is 3/4 mtr. In height and it is sufficiently broad giving the old structure the shape of a casket. The jagati enables the visitors to go round the temple and have a clear view of the fine sculptures on the outer walls. The jagati is designed with the projections and recesses in harmony with the contours of the outer wall as is common with any Hoysala temple. The outer wall is divided into two portions.